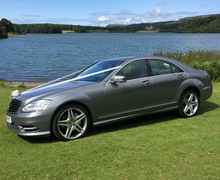 Our new S-Class Mercedes Bridal Car & Wedding Limousine are always presented in immaculate condition and are ideal for your wedding day transport. These cars are very spacious, and brides and bridesmaids find it easy to get in and out of the cars in a dignified and stylish manner. The cars can be dressed to your own requirements such as ribbons, bows, flowers and rosettes, in colour's of your choice. perhaps to match bridesmaids dresses. Drivers are all dressed smartly in three piece suits and silver tie and all have many years experience in the conveyance of wedding parties and the various photo and reception locations in the local area.